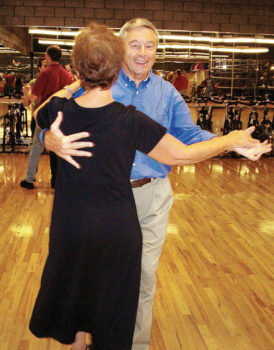 Basic Social Dancing – What is it? Well, … it’s dancing designed for those who don’t need to move like Fred and Ginger but who want to avoid looking like Laurel and Hardy. Another goal is getting in on the fun you can have on a dance floor ASAP! Classes meeting the above goals are available to all SunBird Golf Resort residents and their friends and guests. We learn about the basic rhythms of dance and the principles of leading, following and being a great partner. Our fearless leaders don’t even need to know what the dance is. The same movements will take you through the Fox Trot, Rumba, Swing, Cha Cha, Tango, ‘50s, Old Time, Country/Western style music … you name it! At the end of the first hour, you will be amazed at yourself! It’s so simple … a few bananas and a monkey could do it! Walk In ~ Dance Out!